The 'mighty totara' is one of New Zealand's most extraordinary trees. Among the biggest and oldest trees in the New Zealand forest, the heart of Maori carving and culture, trailing no. 8 wire as fence posts on settler farms, clambered up in the Pureora protests of the 1980s: the story of New Zealand can be told through totara. Simpson tells that story like nobody else could. In words and pictures, through waka and leaves, farmers and carvers, he takes us deep inside the trees: their botany and evolution, their role in Maori life and lore, and their current status in New Zealand's environment and culture. New Zealand's largest trees, the kauri Tane Mahuta and the totara Pouakani, are both thought to be around 1000 years old. They were here before we humans were and their relatives will probably be here when we are gone. This book tells a great tree's story, and that is New Zealand's story too. 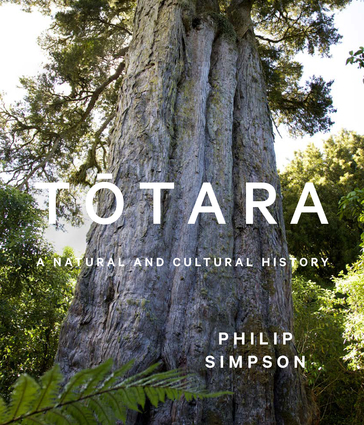 Philip Simpson is a botanist and author of Dancing Leaves: The Story of New Zealand's Cabbage Tree, Ti Kouka (Canterbury University Press, 2000) and Pohutukawa and Rata: New Zealand's Iron-hearted Trees (Te Papa Press, 2005). Both books won Montana Book Awards in the Environment category and Pohutukawa and Rata also won the Montana Medal for best nonfiction book. Simpson is unique in his ability to combine the scientific expertise of the trained botanist with a writer's ability to understand the history of Maori and Pakeha interactions with the environment. He was awarded the Creative New Zealand Michael King Writer's Fellowship to work on Totara: A Natural and Cultural History.